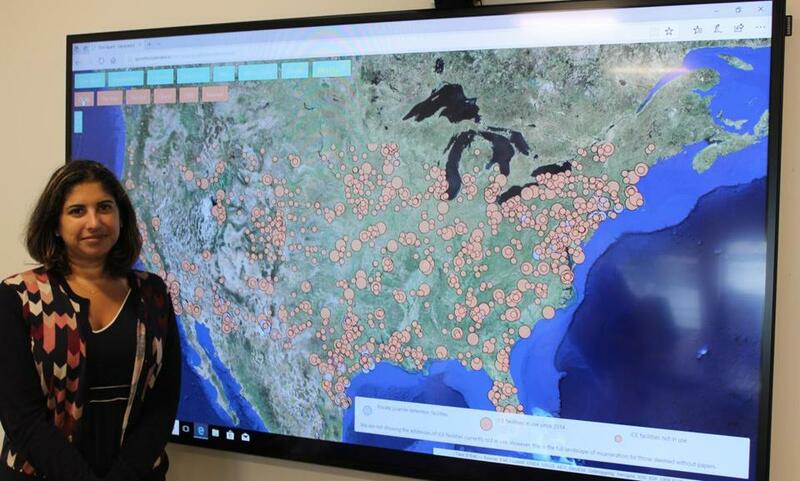 Roopika RisamRoopika Risam and her team created a map of Immigration and Customs Enforcement detention centers for adults and children. A Salem State University educator will be recognized this month by public libraries across Massachusetts for her work connecting the dots between humanities and the digital world. Roopika Risam, an assistant professor of English, will accept the inaugural Massachusetts Library Association’s Civil Liberties Champion Award at a symposium at the Milton Public Library on Oct. 18. “My interest has been how we can use social justice, particularly in shedding light on untold stories and unheard voices, within digital archives and digital cultures,” Risam said. Risam received the award for her accomplishments in digitizing history, literature, and culture. Much of her work has involved digital text analysis of African and postcolonial literature in an effort to make them more accessible to humanities studies. Perhaps most notably, Risam and a team of researchers from Columbia University and the University of Houston created maps that show Immigration and Customs Enforcement (ICE) detention centers for adults and children and how they are funded. “Torn Apart/Separados” evolved as a response to the family separation policies that were announced by the Trump administration in May. “We started looking into a way to see if we could mobilize our skills in digital humanities to respond,” Risam said. The research team spent a week collecting data from public records. It also shared data with The Washington Post, which had created a similar map visualization of ICE detention centers. Risam said the team hoped their work would inspire people who could help reunite immigrant families. “If we can find and map this data and get it out into the world and into the media cycle, then we could get this work into the hands of lawyers, social workers, and activists,” she said. Risam is the first recipient of the library association’s Civil Liberties Champion Award. It can be presented to a public official, business person, author, or institution that has contributed to society by protecting civil liberty, safeguarding constitutional freedom, and promoting social responsibility. Jacqueline Rafferty is codirector of the library association’s Intellectual Freedom & Social Responsibility Committee, which presents the award. She is also director of the Paul Pratt Memorial Library in Cohasset. For that reason, choosing Risam was a unanimous decision, she said. “Making all that information accessible to the American people is critically important, so that American citizens can know exactly what their government is doing,” Rafferty said. Libraries provide equal access to information and resources and as a result, strengthen democracy by informing and empowering citizens, Rafferty said. The Massachusetts Library Association’s Confronting Inequality Symposium will be held on Oct. 18 from 10 a.m. to 4 p.m. at the Milton Public Library, 476 Canton Ave.
Two experts also will speak at the symposium on related topics, such as the future of inequality in capitalism and technology. The event is open to the public. Tickets are $50, available at bit.ly/ifsrc2018. For more information on the library association, visit masslib.org.